Prepare for battle in Puzzle Hero! You must save your kidnapped brother, Tristan, from sorcerer Zalock’s spell and his Army of Darkness. Outwit the puzzle and battle the mystical monsters that guard the road to the Kingdom of Fog. Increase your power by gathering gold and using it to shop for magical amulets, amazing selection of weaponry, armor, and clothing accessories. 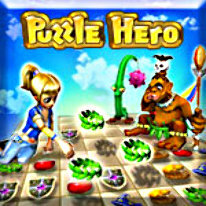 Adventure and glory await you in Puzzle Hero!